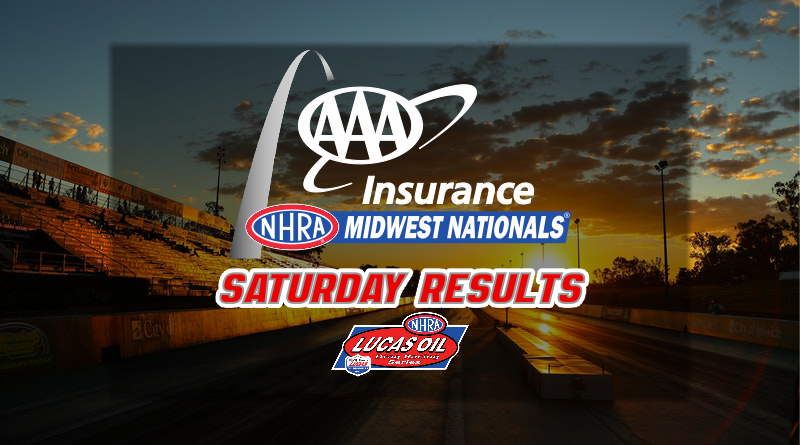 ST. LOUIS – The AAA Insurance NHRA Midwest Nationals kicked into high gear on Saturday as the sportsman competitors raced through four rounds of eliminations. At the end of the day only four competitors remained in Super Stock, Stock Eliminator, Super Comp, and Super Gas while eight racers remained in the SAM Tech Factory Stock Showdown. The remaining competitors are two to three win lights away from collecting the Wally. The story of the race has to be Brad Zaskowski who needs to make the final round to overtake Justin Lamb for the lead in the national points standings. Zaskowski controls his own destiny as he will race Tyler Wudarczyk in the semifinals on Sunday. The other half of the semifinals includes Greg Stanfield and Ricky Decker. Four-time world champion Stanfield is DragChamp’s last hope to pull out a win on Sunday as our other two picks from our Sportsman Preview article (Brad Plourd and Slate Cummings) fell in the early rounds. To reach the semi’s, Stanfield won a heads-up GT/IA contest against fellow Division 4 racer Koree Mawhee in the fourth round. Stanfield’s 9.602 easily covered Mawhee’s 9.665. Pro Stock competitor Drew Skillman continues to show his versatility as a driver as he leads the Stock Eliminator field into the semifinals on Sunday. Already a national event winner earlier this year at the Mile-High Nationals will look to pick up his second Stock Eliminator win of the year in addition to his Pro Stock victories. Skillman will meet Brett Candies of the famed Candies Family Racing Team in the semi’s on Sunday while Brett Speer will face off against the 442 Olds of Daryl Bureski. All three of the DragChamp picks (Austin Williams, Adam Davis, and Jeff Lopez) fell early in eliminations. After picking 4 out of 4 finalist last week in Reading, we’ll have to settle for much less success this week. As expected, the parity adjustments that the NHRA instituted after INDY did very little to slow down the Drag Pak Challengers of Don Schumacher Racing as Mark Pawuk and Leah Prichett once again dominated the field. Pawuk took the one spot with an impressive 7.929 which was followed closely by Prichett’s 7.936. The Stanfield powered Camaro’s of Arthur Kohn, Steven Bell, and Aaron Stanfield rounded out the top ten although like at INDY, they were about a tenth behind the Dodge’s. After two DQ’s at INDY, two-time 2018 national event winner Joe Welch did not enter the #AAAMidwestNats this weekend. There were very few surprizes in the first round as all of the top eight qualifiers moved into the second round. Peter Gasko did win without even leaving the starting line as his opponent Dan Stevenson crossed the centerline handing the win to Gasko. We’ll see if Gasko can repair his ride for the second round. Drag Champ pick Leah Prichett is in great shape to win her second straight Factory Stock Wally. Like Stock, the DragChamp picks fell early at St. Louis as Tommy Phillips exited in round three while Michael Miller and Jacob Elrod were trailered in the earlier rounds of eliminations. Cole Cummings will take on Crew Chief Pro’s Don Higgins in the semifinals while Scott Cook will take on Rick Hughes. Higgins made it to the semi’s after posting lights of .070 and .085 in the first and fourth rounds respectively. Even with a couple of terrible lights, Higgins has defeated a number of tough competitors including Jacob Elrod, Dave Dahlem, and Jackson Collier. Cummings, of the famed Cummings family race team out of Louisiana, is looking for his first national event victory. To reach the semi’s, Cummings defeated Philip Oakley, Tyler Caheely, and Tommy Phillips before taking a .005-second victory over Brian Cassin in the fourth round. I believe Cummings will get it done on Sunday and pick up his first NHRA national event Wally. In Super Gas, the top two drivers in the national standings squared off in the second round. With Devin Isenhower claiming his last national event and Ray Sawyer trying to run him down in the standings, they met in round two with Sawyer taking the holeshot win. With Isenhower now out of opportunities to improve his points total, he’ll have to sit and wait to see if anyone can catch him. After the huge second round victory, Sawyer fell in round three to the previously mentioned Cole Cummings. Sawyer still has a couple of nationals to claim as he chases the national championship. I’m sure he’ll head to Charlotte looking for a late round finish in order to catch Isenhower. In the semifinals, Tim Nicholson, who drives a stick-shifted, top-end throttle-stopped ’67 Camaro (check out a cool video here) will pair up with the Vega Wagon of Larry Bernshausen and Michael Miller (I picked him to win Super Comp, guess I chose the wrong class) will pair up with Mitch Withers. As with most of the classes at St. Louis, my pre-event Super Gas picks didn’t fair well as Tommy Phillips, Jackson Collier, and Ray Sawyer all fell by the third round. Although it’s not the class I originally picked him to win, I think Miller has the advantage on Sunday and should take home the Wally. There was much anticipation prior to the event that the Top Dragster bump could be in the low 6.20’s. Although it was a quick field, 6.371 bump, it wasn’t near as quick as some had hoped. Once again, my pre-event picks fell early as Aaron Stanfield, Mark Jones, and Jeff Strickland were eliminated by the third round. In the semifinals, defending world champ Lynn Ellison will look to capture his first national event of the year. Ellison will meet up with Jennifer White on Sunday while J.R. Baxter will race Afton Swanson. The class that impressed me the most in qualifying was Top Sportsman. The bump was an impressive 6.90 with several cars topping 220 mph. The field was led by Northwest Nationals winner Bryan LaFlam and his super-quick Mustang after posting a 6.193 at 231 mph. Sunday’s semifinals will be led by two-time 2018 national event winner Don O’Neal as he takes on Bill Yates Sr. while versatile sportsman racer Phil Unruh will take on Glenn Butcher. When Mark McDonald fell in the third round, my hopes of having another racer join Greg Stanfield on Sunday disappeared. My other two pre-event picks also fell early as Jim White and former world champ Mike Williams lost early. That’s a wrap on the Saturday sportsman results. Check back daily as we’ll post final round results as soon as they are available. Drag Champ is drag race central for all your drag race results. Visit DragChamp daily for the latest news and results from the world of NHRA sportsman class racing.